Starting in the name of Allah the most Merciful. 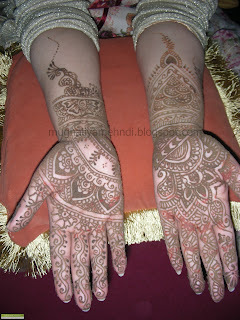 Mehndi most populary knowm as Henna is a temporary form of skin decoration. Its a hobby adopted with great zeal amongst eastern girls and no doubt it is a pride of an eastern girl. In west it has also been introduced as henna tattoos Like jewelry, designing and dressing, mehndi has always remained on the top of the lists when it comes to girl interests. Eid, Shab-e-Barat, Marriages, Birthdays, Family dinners, Get togethers are incomplete without mehndi, and the competetiton amongst the girls to beat each other in design is always on. Mehndi has always remained one of ardent hobby, and i take pride in it. 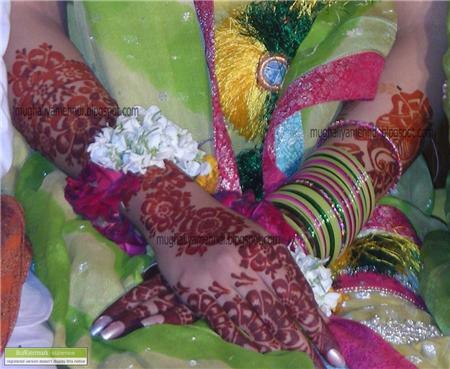 To me mehndi potrays the personality of a girl, her creativity, her focus towards making a home and her zeal of life. I have been into mehndi from childhood and since then i have drawn hundreds of designs of my own, so finallt now decided i should write a blog and upload my designs, So girls if you want some designs do check out my blog and if you have some designs do subscribe to my blog and post your design too.